This season has been filled with some lovely moments, many of which have revolved around the idea of memories. My professional association with Barkerville began twenty-one years ago but my earliest recollections of the place date back to the 1970s when, as a child, I visited our site for the first time with my two sisters. I remember that first visit with a vividness that outshines other, more time-worn childhood memories. Some forty years after the fact the images in my mind of walking to Richfield, watching Judge Begbie speak, the stagecoach, the Theatre Royal… are all crystal clear. I continue to be fascinated by how acutely Barkerville sears itself into the memories of our visitors and professional associates. Perhaps more than any other this season has been happily full of friends who carry with them stories of the significant place Barkerville holds in their own, personal mythologies. In June I met an elderly couple from Quesnel who told me they had first visited Barkerville in 1952, and have come back every single year since. That is over half a century of stories. I spoke with the couple at some length and was delighted to hear of how they used to drive straight up the main street, and how they loved the early days when the “old-timers” – the last few permanent residents of town – were still around and available for chats with tourists. As the season progressed I met many other guests with long, cherished associations with our National Historic Site. Barkerville, it seems, is not just a heritage attraction, it is a catalyst for remembering; a character in the storyline of our lives. This week has been graced by the return of many of our own local old-timers, here again for a moment or two to bask in a place that has, to some extent, defined them. There was Wee, a dear lady who has told me the most amazing tales of her childhood in Wells during its Gold Quartz heyday. She knew Fred Wells himself, and can still recognize all the 1930s miners by name when she looks at archival photographs. Cowboy Tom, an old Barkerville teamster, also came back to us this week. Tom is a true gentleman. He was – and is – a favourite of the ladies, and it was wonderful to see him bask in a cloud of hugs and kisses from many long-time female interpreters. Rev Trev made one of his regular sojourns to town a few days ago and, like always, we were able to have a quick catch up which always brings me right back to his years as our “Reverend Reynard” at St. Saviours Church. Her words leaped right into my heart. This is why long-time interpreters do what we do. We are actors, yes, and Barkerville allows us to practice our craft… but more than that, it allows us to be part of something bigger and deeper than our jobs. This family’s memories of Barkerville inspired a moment that I will carry with me for the rest of my life. I am honoured beyond anything I can adequately express to be part of that family’s mythology. Barkerville holds memories, creates memories, and becomes memory. The spirit of Barkerville is a generous one. Barkerville allows each of its visitors to claim it and hold it and remember it. Barkerville does not allow itself to be insignificant. Our town works itself into hearts and minds and is graciously reliable in its ability to live up to itself; to the image it holds in the minds and hearts of so many wonderful people. 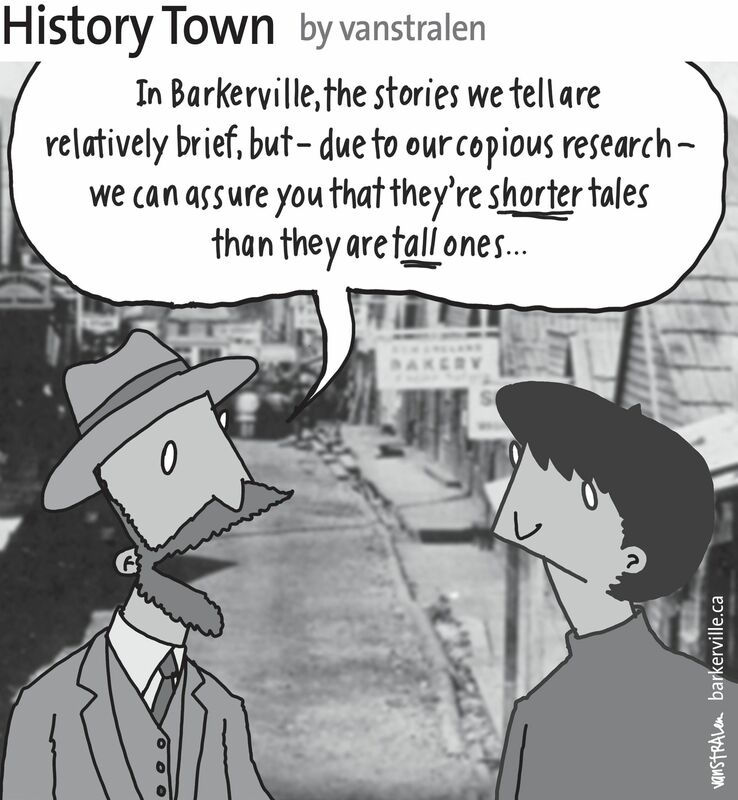 The above one-panel cartoon (originally published August 30, 2014) by Dirk Van Stralen, with accompanying editorial by Danette Boucher, is the sixteenth of twenty weekly entries that were logged – and subsequently blogged – as part of a 2014 collaboration between Barkerville, British Columbia and the Prince George Citizen aimed at introducing some of the quirkier advantages to living, working, and playing in the Cariboo Goldfields. We hope you enjoy!